Learn how to view and manage your contacts' email subscription types. Contacts can manage their email preferences using the links in the footer of your marketing emails. You can also send contacts a link to manage their own email preferences. On the left side of the contact record, navigate to the Communication subscriptions section. Use the New Opt status dropdown menu to select an opt status. Click the Communication subscription types dropdown menu, then select a subscription type. If you have GDPR functionality enabled, select a lawful basis for communicating and enter the explanation for communication consent. Additionally, you'll also need to add a lawful basis to process to track and store the contact's details in your database. You can opt contacts into a subscription type in bulk from the contact dashboard. 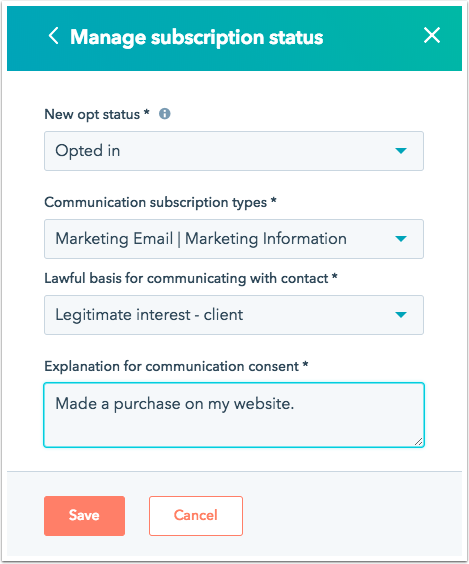 You can also remove an opt-out of all email status that was added manually by a user in your HubSpot account. Click the More dropdown menu, then select Add communication subscription for contact. Click the New Opt status dropdown menu to select an opt status. Select a Contact-based workflow, then click Create workflow. Click the pencil icon edit and enter a workflow name. Click Set enrollment triggers to to select the contacts you want to enroll. Click the plus icon + to add your workflow actions. Under Contact properties, select the Manage subscription status action. Click the Communication subscription types dropdown menu, then select a subscription types. Add any additional actions to your workflow. Click the Settings tab and edit the workflow settings. When you're done, in the upper right click Review, then click Activate.